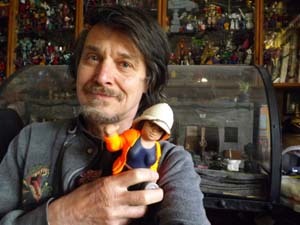 Lewis has 30 years experience in the Australian film industry working in miniature effects, special props and art department design. Films he has worked on include Razorback, Dark City, The Matrix Trilogy, Star Wars Episode 2 and Epsiode 3, and Superman Returns. He also lectures on design and character creation for tertiary and high school students. Lewis’ workshops cover drawing skills for comics and storyboards; character design and character through posture; what is creativity and where does inspiration come from; the ethics of research; originiality versus plagiarism; sculpture as a quick design tool.